Stitch these unique Teddy Bear Girl and Boy couples for each month. Use them as coasters, magnets, gift tags, mobiles and more! Each Teddy Bear is 3-3/4" wide by 5-1/2" high. Stitch on 7-count Plastic Canvas with 4-ply Yarn. 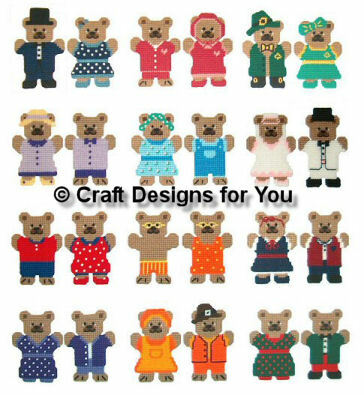 Complete Set of 24 Teddy Bears of the Month Plastic Canvas Patterns for only $8.95!